It’s always something of a question as to whether to let someone look behind the curtain at your creative process. It’s messy back there–blobs of ink, half-formed words, trailing threads, and heavens forfend those dangling participles. Words themselves have been slippery fishes of late, and I find myself turning to solid crafts that satisfy my hands, like knitting, drawing, and beading. Still, take for example the sigil crafted for Crow this month. You can get a pretty good idea of it from the picture at the head of this post. Yes, it’s still rough, but it’s showable, particularly for an article dealing with artistic process. 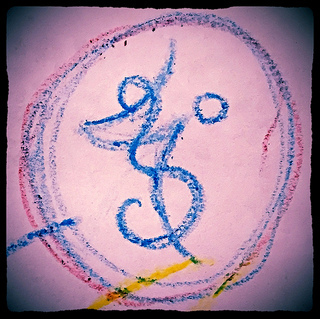 Sigil work, at least as I see it, isn’t just the tracing of lines over a witch’s wheel. Sure, you can start there, but if there is to be any spark, any soul in the magical anchor, there has to be more than that. To paraphrase Jason Miller, the most powerful sigils are the ones wrested directly from that Beyond space and brought into being on this plane. That jujitsu match is ugly. There are many false starts, no little dismay, and often a feeling that this sigil is always going to look like crap and there’s nothing you can do to tell it otherwise. This is where a child comes in handy. Inner, outer, literal or metaphorical–let the kiddies out to romp. Stop wrangling and start playing. Tussle, cross things out, let colors cohabit that would make Andy Warhol wince. Sigil crafting is a protean art. 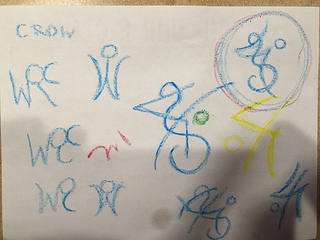 Hold onto it too tightly and Awen slows to a trickle, left with nothing more than a madwoman’s scrawl across a restaurant napkin. Let go and see the lines swell with color and form, twisting around your mind until you know there is no other way for them to be. It sure as hell ain’t pretty, but it’s process. 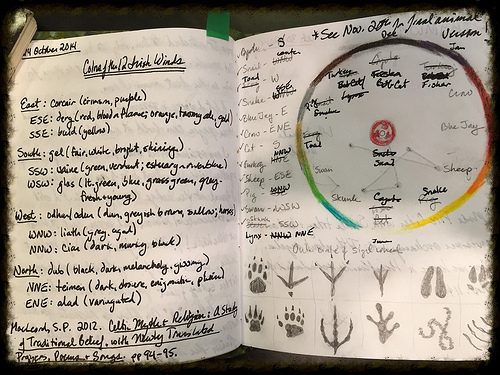 Here’s what a real live book of Ovate field notes looks like–messy huh? One of the things that came out of my final ritual for Cerridwen was working with the 12 winds of Irish tradition. Despite my Sun sign being the ever earthy Capricorn, the most predominant element in my natal chart is in fact Air. It seems like a logical extension to incorporate that nature as much as possible into my practice. The Irish winds, which I first read about in the OBOD bardic course, provide a non-Golden Dawn derived structure for laying out ritual space. I want to try shaking up my paradigms a bit, I feel like I’ve gotten a bit too comfortable to be ritually creative in some ways. This would also be incorporating some more Irish flavor in my work, which has not been a culture I found myself particularly drawn to beyond Lugh (ALLTHETHINGS!) and possibly Macha. I’m honestly not sure how I feel about poking about the Irish lore, partly because I have little to no known heritage from that land, and partly because I’ve been trying to stick to a Welsh-focused practice of late (despite some academic dabbling in Powwow). 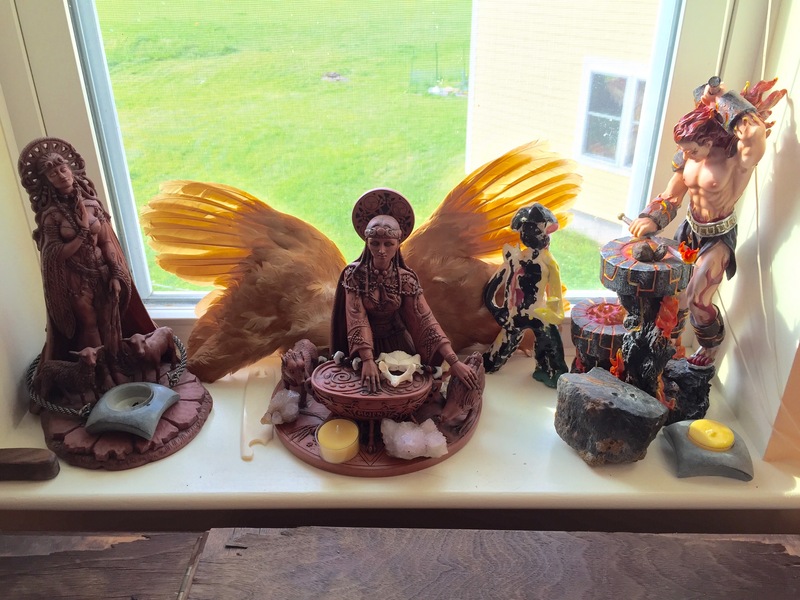 But it’s also true that gods and spirits seem to come and go as they please with little regard for maintaining the purity of their culture of origin (hello, Hekate!). So, in the long run, is incorporating a bit of obscure Irish color correspondence a grievous offense? I don’t think so, and I’ll have to count on the Winds letting me know if it’s otherwise. I’ve also been trying to work more with the animals that actually live on my land. I spent quite a while working with what I term the Ancestral Tribal Spirits, but now it’s time to sink myself more deeply into the ecology of the Assabet River bioregion. Because I was trying to make a triple set of correspondences with the Irish winds, colors, and local animals I settled on 12 beasties that can be found if not in my backyard then within my town. These are: bobcat, fisher, crow, bluejay, sheep, snake, coyote, skunk, swan, toad, pig, and turkey. 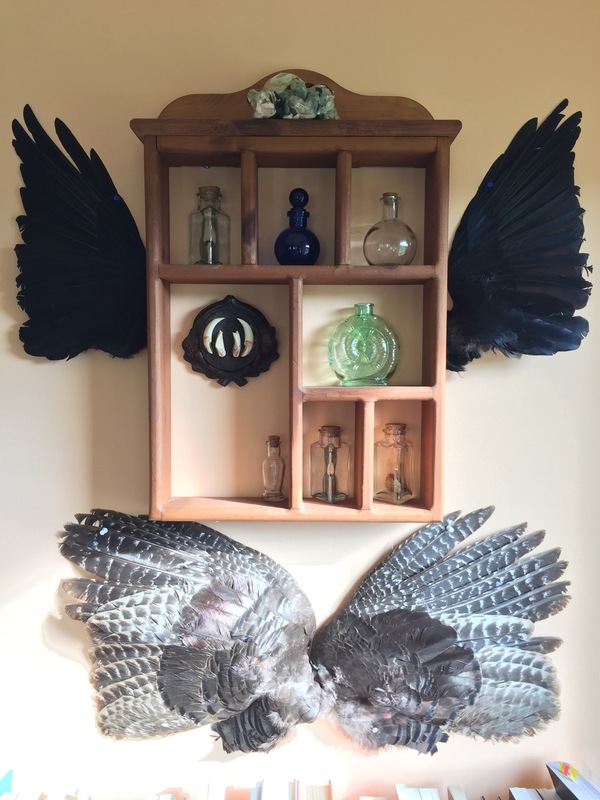 I’ve slowly been gathering skulls or other bones from all of these creatures, in order to deepen my connection and eventually create focus bottles/boxes for them. During the last dark moon, I worked heavily with a fisher skull, painting it and devising a sigil to capture its essence. This month will be crow. But now I’m wondering if I shouldn’t break apart these two tasks–the task of meditating on and learning the nature of the winds, and also then reaffirming my relationships with the local nature spirits. Initially I was going to paint the bones in the color of the corresponding wind, but in some cases this just doesn’t seem to gel properly–for instance, bluejay definitely resides in the Spring/East, but the Wind Corcair (translated as crimson or purple) really doesn’t seem to suit. So having talked all this through with you, dear readers, I will likely be focusing on the winds for the full moons, and doing the bone work for the dark moons. I have a bit of catching up to do with the Winds, namely Temen (NNE) and Alad (ENE), but I think it’s doable. And with any luck, there will also be some degree of blogging for your reading pleasure. These may just be pictures, as many of the Cauldron Born posts were, but I hope it proves interesting nonetheless.